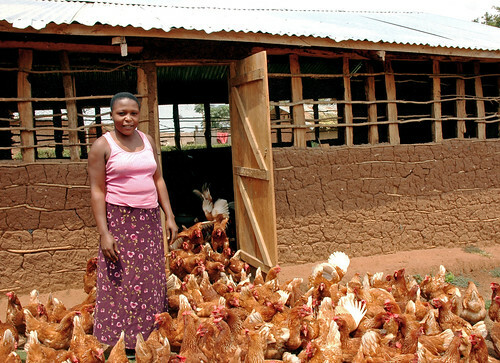 A woman in Uganda lets her chickens out to forage during the day (photo on Flickr by Jennifer Wilmore/Bread for the World). This news article was developed by Tim Robinson with the help of Delia Grace, both of ILRI. As reported last week in a scientific paper published in the Proceedings of the National Academy of Science (PNAS), Global trends in antimicrobial use in food animals, worldwide antimicrobial consumption is expected to rise by a staggering 67% between 2010 and 2030. Five countries—Brazil, Russia, India, China and South Africa (the so-called ‘BRICS’)—will experience a growth of 99% in antibiotic consumption. Use of such drugs has grown as livestock systems intensify around the world to meet a growing world demand for meat, milk and eggs, particularly in developing countries. Widespread use of these drugs to prevent disease in farm animals or to promote their growth is a growing concern. Inappropriate use may contribute to growing microbe resistance, which makes these drugs ineffective in treating infections in people as well as animals. In addition, residues of the drugs used in certain types of livestock production systems can harm consumers of animal-source foods. But, Robinson says, poor people, including those that keep livestock, are likely to suffer a disproportionately high share of the adverse effects of high microbial use in farm animals. Robinson is one of a group of scientists, including lead author of this paper, Thomas P Van Boeckel, of Princeton University, leading a global effort to map the implications of the ‘livestock revolution’ now under way in the developing world. For Robinson and his colleagues and partners, this study presents regulators with a knotty problem: They want to rein in a practice common in some countries that could push us closer to a time when common, treatable infections become a death sentence. But they want to do so without intensifying malnutrition, poverty and livestock diseases among the one billion poor people in the world who depend on livestock for both food and income—and actually need more and better drugs to keep their farm stock alive and productive. Overall, the scientists caution against the simplistic view that policies and procedures used in the US and Europe to reduce antibiotic use among some livestock producers can or should be adopted wholesale in low- and middle-income countries. A survey by the World Organisation for Animal Health (OIE) found 91% of members has legislation covering veterinary medicines, and in most cases legislation covered importation, distribution, marketing and use. Only 27% of members had an official system for collecting quantitative data on veterinary medicines, and of those that did around half made the information available. Around half (51%) of countries ban antimicrobials as growth promoters while 19% have a partial ban and just 30% no ban. Legislation, surveillance systems and bans on growth promotion are all trending upwards and there is increasing support for integrated ‘One Health’ approaches to managing antimicrobial resistance, which is articulated in the strategies of both the World Health Organisation (promoting human health) and OIE (promoting animal health). ‘Antimicrobials are used in livestock production to maintain health and productivity. These practices contribute to the spread of drug-resistant pathogens in both livestock and humans, posing a significant public health threat. We present the first global map (228 countries) of antibiotic consumption in livestock and conservatively estimate the total consumption in 2010 at 63,151 tons. We project that antimicrobial consumption will rise by 67% by 2030, and nearly double in Brazil, Russia, India, China, and South Africa. This rise is likely to be driven by the growth in consumer demand for livestock products in middle-income countries and a shift to large-scale farms where antimicrobials are used routinely. Our findings call for initiatives to preserve antibiotic effectiveness while simultaneously ensuring food security in low- and lower-middle-income countries. Given the potential costs of inaction, this study, among others, calls for urgent and concerted action in all countries, which is needed to limit the overuse and abuse of antimicrobials in food animal production. These actions should include (i) implementation of a publicly funded international surveillance network of antimicrobial consumption in food animals in countries undergoing rapid intensification in the livestock sector, (ii) collaboration with veterinary drug manufacturers and animal feed producers to cross-validate estimates of consumption with sales data, (iii) implementation of an international agenda to harmonize regulatory frameworks among countries, and (iv) the ultimate phasing out of antimicrobial use for growth promotion, based on the successful experience in the European Union and the new biological and economic evidence challenging the purported benefits of antimicrobial use in food animal production. Global use of antimicrobials in food animals, by Thomas P Van Boeckel (Princeton University), Charles Brower (Center for Disease Dynamics, Economics & Policy), Marius Gilbert (Université Libre de Bruxelles), Bryan T Grenfell (Princeton University), Simon A Levin (Princeton University), Timothy P Robinson (ILRI), Aude Teillant (Princeton University) and Ramanan Laxminarayan (Center for Disease Dynamics, Economics & Policy),Proceedings of the National Academy of Science, early edition, 20 Mar 2015. Support for this study was provided by the Organization for Economic Co-operation and Development, the Department of Homeland Security, the Bill & Melinda Gates Foundation, the Fogarty International Center of the National Institutes of Health and the Princeton University Grand Challenges Program. Tags: AMR, BMGF, Delia Grace, Department of Homeland Security, Fogarty International Center, NIH, OECD, PNAS, Princeton University, Tim Robinson. Bookmark the permalink.